It’s difficult to overstate the phenomenal success of blind Italian opera singer Andrea Bocelli. As the top-selling recording artist in the history of classical music, a recipient of Italian knighthood, and the man responsible for repeatedly landing classical music at the top of international pop charts, Bocelli is literally without parallel. Classics like “Time To Say Goodbye,” Bocelli’s signature song and one of the top-selling singles of all time, have made him one of the most instantly recognizable voices in music, beloved by fans of all ages for his passionate vocal delivery. In 2013 Bocelli released his 14th studio album Passione, featuring duets with Jennifer Lopez and Nelly Furtado, followed by his fourth live album Love in Portofino. 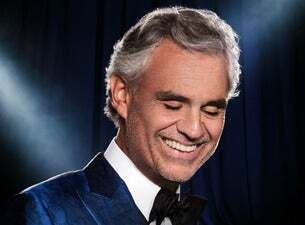 The ever-prolific performer is back on tour in 2013, and ticket buyers will be the first to tell you that all the live albums in the world can’t compare to seeing Bocelli live in concert.